Why do I want these Discs in my Arsenal? That’s a great question and one that we’re going to answer in three sections. By performing extensive field tests and prototyping, we have successfully created designs that are not only aerodynamic and extremely comfortable to throw, but also discs that demonstrate unwavering control. Our final 5 designs all serve their unique and individual purposes, and collectively satisfy the needs of a player in every possible situation. Geometric design isn’t the only factor that was tested for optimal performance. Throughout the Arsenal Discs journey, many different materials and plastics were considered and tested. In addition to comfortable grip and flight properties, we emphasized heavily on the durability of our plastics. Our engineering team considered many different material properties to ensure that our discs had the perfect flexibility, grip, durability, UV resistance, and overall performance. Our team dedicated themselves to creating discs whose flight performance was equally as impressive as their artwork. We wanted to create a level of visual appeal unparalleled in the current market. Our graphic design team worked to create a retro, combat-like theme for our disc artwork. 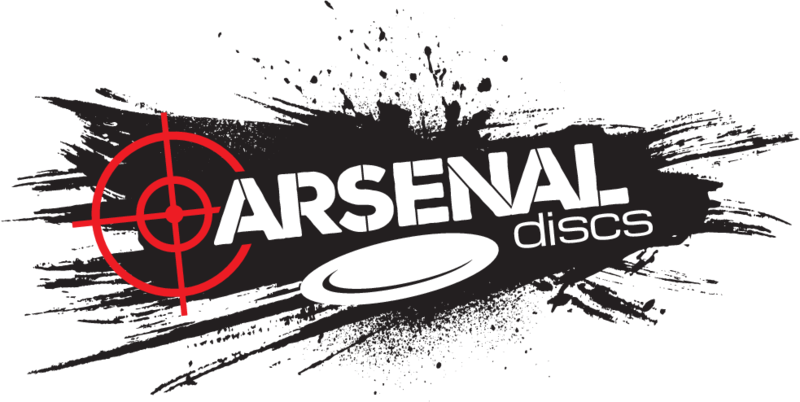 The name “Arsenal Discs” is derived from the premise that each disc a player carries is a distinct weapon. We are currently finalizing our next batch of production for an early autumn release. Join our mailing list for the latest updates and access to exclusive deals! We are also exploring new plastic blends and developing three new discs: a driver, a midrange, and a putter! Follow us on social media to stay updated about Arsenal’s latest ventures.